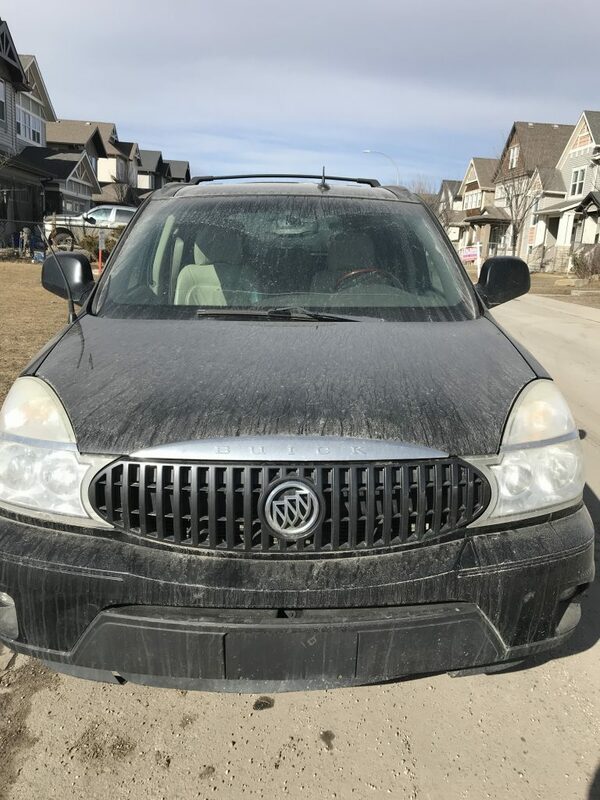 "Buick Rendezvous, 2009. Broken down on Northbound Metis trail. Parked on the shoulder." Had you told us 50,000 kms ago that our trusty Buick would get us all the way to March of 2019 we would not have believed you for a second! We knew this was the final service call we'd make for this faithful SUV, and it came with a flood of memories. 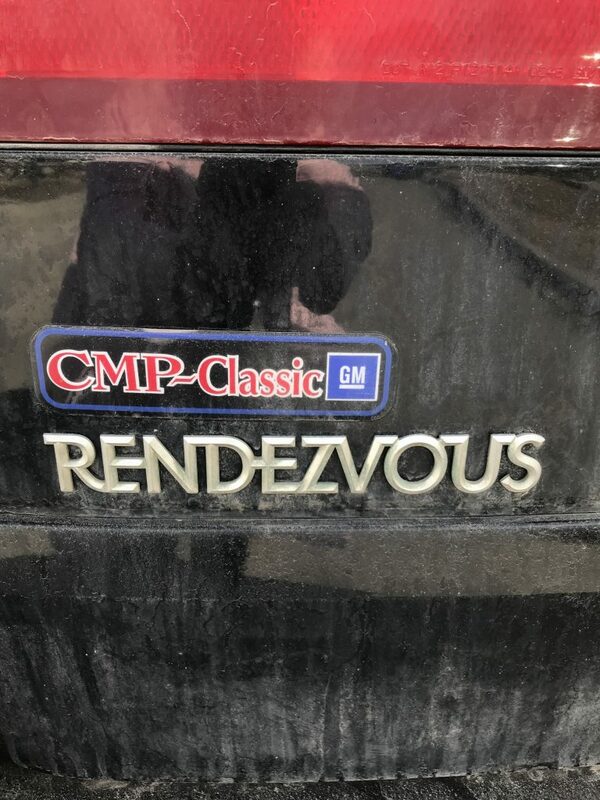 When our family was ready to transition from a minivan to something smaller, , the Rendezvous was our go-to. This was the fanciest vehicle we'd ever had (Heated seats and mirrors that adjusted themselves? So fancy!). We loved it! Storage space in the SUV wasn't optimal, but that didn't stop us from using the poor ol' girl like she was an F150. Over the years we've moved many friends from one home to another. We've hauled lumber and gardening soil and trees. She got the kids through years of hanging out with buddies (read: that vehicle hauled a lot of bodies, weird combinations of sporting and gaming equipment, and debris). We're a road tripping family - because who can afford to fly with 3 kids? Well...who can afford to fly them and feed them? Since we had to choose between the two, we opted to feed them. They seemed to appreciate that. When the kids were still travelling with us the drives would take us South of the border in search of sun and warmth and adventure. One of our most memorable trips was taken in the Buick. That hearty black wonder got us all the way down to New Mexico, USA. I don't think we ever (like, never) got all of the White Sands, NM sand out from the carpet fibres and various nooks and crannies of that vehicle? We had dramatic tire trouble (that's a story of its own...) in an effort to short-cut our way to the Giant Array (again, more on that next week), and just about drove the boys nuts with the various other "short cuts" we took in an effort to show them their continent. Winter after winter, long after our sons had purchased their own vehicles, the Buick got us through one tight spot after another. The kids went from kiddos to adulthood while we had the Buick. With 5 adults, our family has a pretty big vehicle foot print. Work and play demands mean that everyone has their own car...and with that many vehicles in one family , there are a lot of roadside breakdowns, parking lot boosts, and wonky electrical issues. The Rendezvous was the one vehicle that never broke down. We'd leave it parked curb-side for weeks or months at a time, giving it a negligible drive around the block just to ensure we kept the motor functioning and the parking authorities at bay. And every time we needed it, it started right up and got whomever was in a last-minute pinch to where they needed to be. Until just a week or two ago. I'd done the obligatory run around the block/move the vehicle and make it look like someone loves it drive. It started up fine and had that warm and mechanical-gas-y smell of a neglected vehicle. I love that smell. It reminds me of grandpa's old blue K-Car. The one that used to sit out on the farm, years after it had stopped driving. A magical, all-blue automotive playground for the grandkids. Then, one of our boys had car trouble, and without giving it a second thought, he grabbed the Buick keys and headed off to work. The ol' thing didn't get very far before it coughed a little and gave it up at the side of the road. There would be no more last minute saves by that seasoned Buick. For our family, that leads to the easy next-step: donation. The SUV doesn't owe us a thing. From thousands of miles of road trip comfort to truck-like weight-bearing to icy parking lot rescues, it has more than earned its end of life rest. That hardworking auto will keep its generous legacy going by turning into a cash gift for Inn From the Cold, our family's charity of choice. Fitting for a vehicle that kept us warm and safe over so many kilometers.